Video surveillance. MICHAEL PROBST/Press Association Images. All rights reserved. Borders and infrastructure enable or disable the movement of humans and goods, data and money. Therefore, both sites catalyse the future of human togetherness – either fostering equality or aggravating inequality. Can the decisions about the control of movement, and thus about the future of society – that are often made behind closed doors – become a democratic project? Berliner Gazette and Volksbühne at Rosa Luxemburg Platz have invited activists, researchers, coders and journalists to search for answers at the BG Annual Conference, entitled TACIT FUTURES. It takes place in Berlin from 27 to 29 October, initiating discussions and collaborative processes tackling the democratic control of movement. Warming up for this event, Berliner Gazette’s Krystian Woznicki sat down with researcher Catarina Frois to talk hyper-security, video-surveillance and borders. Krystian Woznicki: In your work you have been researching video surveillance, which nowadays has become omnipresent in private space and public space alike. A strong focus of most technologies in this sector lies on predicting futures moves: the analysis of (people's) movements (in particular) within a framework of patterns and a cybernetic approach that could be called 'killing the enemy in its future'. Allow us to pose some questions against this background: by which types of video surveillance do you see yourself and us as society most affected? Which types of video surveillance do you see being debated today, and which are largely neglected? While it’s undeniable that CCTV can be instrumental in aiding security forces... it is useless in predicting intentions or even detecting people's planning to harm others. Catarina Frois: I think the problem of video surveillance, in terms of its preventive purpose, remains today the same as ever (and this applies equally to several other surveillance technologies): you can monitor movements and actions, but so far, you cannot control minds, i.e., while it’s undeniable that CCTV can be instrumental in aiding security forces to investigate and counteract more effectively after the fact, it is useless in predicting intentions or even detecting people´s planning to harm others. Video surveillance in closed environments, virtually omnipresent in today’s semi-public and private spaces – city streets, shops, banks, shopping centres, supermarkets, pharmacies, etc. – as well as video surveillance for traffic control or open areas (streets) are widespread in several major cities. Considering the unstable equilibrium upon which freedom and security are balanced, the current events recently witnessed, with terrorist attacks in various European cities, will only accentuate this enhancement and expansion of surveillance technologies in the name of the former, and consequently a constraint of the latter and a further strangling of the private sphere. KW: How does video surveillance contribute to social sorting as well as discrimination and how does it infringe upon the mobility of people who are concerned by those forms of segregation? It is easy to see how video surveillance can be used wrongly in the absence of proper regulation and legal restrictions. CF: The major problem with video surveillance and the way it tends to be used, has to do with its targeting of specific groups/individuals: young men, ethnic population, people who, somehow, seem to be ‘suspicious’. The thing is that with the current state of affairs, discrimination will undoubtedly be focused on the alien – most notoriously Arab or Muslim types – coinciding with a period in which Europe is facing a severe refugee crisis. This raises serious concerns, because the focus on stereotype, discrimination, prejudice and xenophobia do and will certainly affect a wider population. It is clear that one of the risks involved in the use of any technology lies in its potential for misuse, and it is easy to see how video surveillance can be used wrongly in the absence of proper regulation and legal restrictions. Just think about the state of exception decreed in France after the terrorist attacks last November. Citizens should be aware that we have already virtually accepted the state of emergency as the norm instead of the exception. 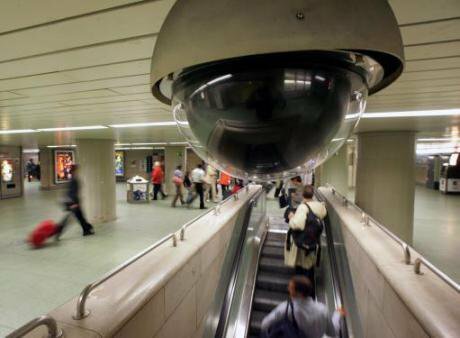 KW: Does video surveillance exert a control of movement? And if so, in which way? CF: One of the major strengths of video surveillance is precisely this: to control the movement of a person or a group and to visualise specific features that may arise: clothing, age, height, etc. When linked through a web connection, several CCTV circuits may follow a specific individual in places and spaces he/she moves on throughout the day, since leaving home in the morning until the end of day when returning. If you are somehow marked as a suspect – the criteria for which must be loosened and expedited in situations of emergency, then you may be controlled. One of the major strengths of video surveillance is precisely this: to control the movement of a person or a group and to visualise specific features that may arise: clothing, age, height, etc. KW: What types of control of movement do you see being exerted with the help of video surveillance? CF: The majority of video surveillance systems used in Europe today (except the UK) are not cross-referenced or centrally managed, and can only control movement in real time, for example through traffic cameras or in tourist sites in major capital cities. Therefore, video surveillance existing in closed environments, since they are not centralised and, most of the times, are not being viewed in real time, are not really ‘controlling’. KW: Do you see video surveillance having an influence on the future? CF: Unfortunately yes, I believe that CCTV is here to stay, its uses are ever broader and more diversified. The tendency – if I have to guess – would be to record in real time not only image but also sound, as well as its increasing cross-reference with other surveillance technologies. The state has the right and obligation to protect its territory and population... but that isn’t necessarily achieved more effectively through the increase of surveillance technologies. KW: What types of democratic control of movement should we be fighting for in this context and with which imperatives? What is the state meant to do in this context? What do we need from the state and what are we entitled to? How and in which respects/areas can we gain partial autonomies from the state? Could you describe concrete examples? CF: Citizens can and should always claim their right to privacy, to autonomy, fighting not only prejudice and discrimination against one’s self but also against others. The major enemy in this endeavour is fear and ignorance. The state has the right and obligation to protect its territory and population (remember Michel Foucault’s title Security, Territory, Population), but that isn’t necessarily achieved more effectively through the increase of video surveillance or other surveillance technologies which also entail potential for negative uses. In other words, there is always space for debate on the best means to achieve a desired end, and perhaps we tend to rely too readily on ‘high’ technology, neglecting other more simple and ‘softer’ tools at our disposal. Citizens need to be aware of the dangers they face and to protect themselves, and sometimes that should be done by paying attention to what happens next door. It is common for people to neglect situations of poverty, violence, mistreatment, to consider that it ‘is not their business’. Communities and neighbourhoods have a major task to perform in this respect. That is not the same as saying that we have to ‘control each other’, but instead to call for the attention of city councils, for example, when streets are not properly illuminated or appear to be degraded; to educate our children in respect for difference and to incorporate these same values in our community. On the other hand, I always stress that I do not see in video surveillance an ingenuous state or police plan to exert control. Sometimes (video) surveillance is used for what it was intended originally, but other times the information collected is not even properly used, as I have repeatedly witnessed in my investigations, namely when considering the lack of exchange between security forces within one or more than one country. On the other hand, it is also easy to fall into the other extreme, and to turn the debate on security into a pretext for political rhetoric, where the most important issue – the protection and freedom of people – is somehow forgotten. This is to say that even though we should be aware of our rights and the rights of the others, we must neither see surveillance as the solution for all our problems, as the only solution for a given problem, nor as the root of all our concerns. Just as security and freedom need a fine balance, so too must our debate on surveillance strike an even balance. Join the TACIT FUTURES Public Talks on 27 – 29 October in Berlin. Speakers include net activism pioneer Konrad Becker, internationally celebrated process philosopher Brian Massumi, leading refugee activists from the International Women Space, and the key thinker of the post-colonial movement Gayatri Chakravorty Spivak. More information here.